Kickboxing is a sport that utilizes martial arts kicks and boxing punches to firght your opponent and is similar to the sport of boxing (with the kicks of course). 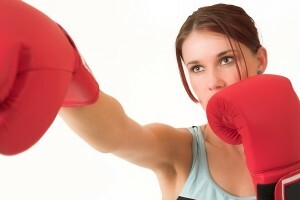 Today kickboxing as a group fitness class has grown as the benefits of kickboxing have been realized. Kickboxing has become even more popular as a great way to drastically improve how you look and how you feel as you get fit! It is a great workout for women becuase it does not build “big” muscles, but tones your body to give you the “fit” look most women want. You do not have to step inside the ring in order to get a great workout because now, Burlington Cross Training is offering women’s kickboxing classes. Your can trust you are in good hands with our Burlington Cross Training kickboxing instructors. Participate in one of our women’s kickboxing exercise classes and you will lose weight as you shape your body and learn new kickboxing skills. Contact us today for a free week of kickboxing classes. and surrounding areas of North Carolina.